Below are the written words of what I shared during the public comment period of the Minneapolis School Board meeting on February 11th, 2014. Part of this has been shared in a recent article in the Twin Cities Daily Planet. One suggested solution that could be considered is allocating staff costs based on an individual schools average, rather then a district average. Hi, my name is Ariah Fine, I’m here today as part of the Northside Schools Collective, a group of Northside parents and community members who are concerned about our students education. My children attend Hall elementary and I am on the site council at Lucy Craft Laney. The facts I’m about to share were compiled from data I requested from MPS and calculated to the best of my knowledge and ability. We are concerned with the “staff-based resource allocation” budget method employed by Minneapolis Public Schools and its implications for Northside schools. Although this method ensures an equitable distribution of full-time teachers, it does not ensure an equitable distribution of resources to pay teacher salaries. Our understanding is that each school is allocated a district average of $66,412 annually per full-time teacher, but schools that are unable to attract teachers qualified to earn this salary spend significantly less than they are entitled, yet have no way to utilize the excess funds they need for educational support. For example, at a school like Lucy Laney that pays its teachers an average of $55,000/year, more than $11,000 per teacher is returned to the district each year; meanwhile Lake Harriet’s average teacher salary of $76,000/year allows them to greatly exceed their school’s initial allocated budget for salaries. I’ve heard this salary strategy is a means to retain experienced teachers. While it may be effective in some schools, it has caused the loss of $2.5 Million from northside schools budgets. Indeed while some schools gain funds outside of their allocated budget to pay for higher-salaried teachers, schools with a majority of Students of Color lost $4.7 million this year, enough funds to hire 70 additional teachers. Meanwhile, schools with a majority of white students gained $2 million from outside of their school budget to pay the salaries of their teachers. This is an equity issue. Looking at in from an income perspective, Schools with a majority of students on Free and Reduced lunch lost $4.25 million, while the others gained $1.5 million. 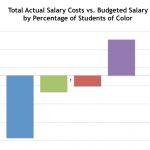 This impact is disproportionately affecting low-income students and students of color. All but 1 north Minneapolis school loses money following this method. Lucy Laney and Bethune together lost over $1 million out of their budget enough to subsidize the salaries of teachers at Southwest, Barton and Lake Harriet. That $1 million could have put 15 more teachers at Laney and Bethune. We understand that many north Minneapolis schools receive additional funds through Title I and other allocations, but those dollars were never intended to replace a loss of funds due to inequitable staffing dollars. This is unjust and we demand a change. MPS is essentially taking money from the budgets of schools with low-income students of color and using those funds to subsidize the salaries of experienced teachers in more affluent parts of the district. We bring this to your attention today with two very specific requests. In the short term, we want to know immediately how you will reallocate funds so that our schools can utilize now what amounted to lost funds so they can hire support staff and meet other staffing needs and how you will address this inequitable funding in future budgets. In the long term, we want to transform Northside schools to make them attractive for experienced teachers so that we can even out the experience gap as well as the funding gap so that our students receive the support and resources they deserve to ensure a quality education. Please make this a priority in your work in the coming weeks and address this inequity now.